noise-influenced industrial, with black metal serving as the filter that taints and completes them. 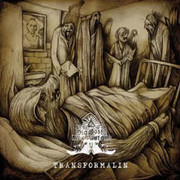 Consequently, ‘Transformalin’ is a jarring experience that can be harshly rhythmic at one moment and the next dive into unmetered, dragging ambience, while still others draw on martial cadences and horn reveries that echo in the background. Though mostly instrumental, he does provide ‘narration’ from time to time with primarily clean vocals that range from manically impassioned to psalm-tone catatonia. Manufactured as a standard Jewel case with transparent tray and sixteen-page booklet. The duration of the songs is not specified, it is taken from the media player.